Teriyaki Grill has a menu that features grilled chicken or steak marinated in a special Teriyaki sauce, char-broiled, then served hot off the grill with your choice of steamed rice or noodles. You’ll experience a fresh, healthy, and guilt-free alternative to the fast food world. Check out their online menu here. 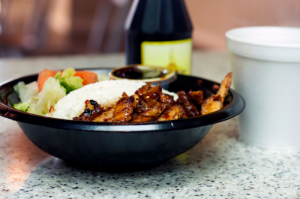 Teriyaki Grill is located in North Village Plaza along with other dining options and a children's playground.